Canadian business patterns data provide counts of active establishments by industry classification and employment size categories. The data are compiled from the Business Register, which is a repository of information on the Canadian business population. Locations without employees include the self-employed, i.e. those who do not maintain an employee payroll, but may have a workforce which consists of contracted workers, family members or business owners. These also include employers who did not have employees in the last 12 months. Please note that locations are assigned to employment size ranges based on employment size estimates derived from payroll remittance and profiling data. The primary purpose of the employment size data is to improve the efficiency of samples selected to conduct statistical surveys. These data should not be used in any manner to compile industry employment estimates. 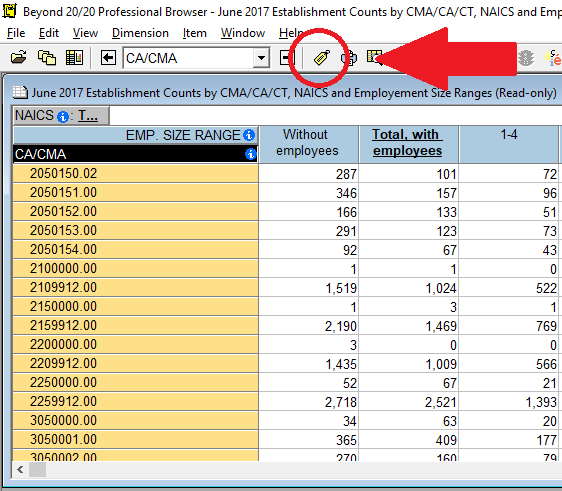 Employment size estimates, as grouped in employment size ranges, tend to measure the annual maximum number of employees, full time or not. For further information on "establishments" and "locations", see Page 9 of this Statistics Canada guide. Statistics Canada advises users not to use these data as a time series. As of June 2015, this product's name has been changed from Canadian Business Patterns to Canadian Business Counts. Changes to the methodology since the December 2014 release affect the number of businesses falling into certain categories. Some changes are described below, but users can also refer to the Definitions and Concepts document for more detailed information (see external link or User guide included on this catalogue page).